Hello everyone and welcome to our seventh dev journal about the Stealth Mod we are making for the Sigil System. In our previous five journal we showed a quick example of the Stealth Mod rules in action and so today we are just going to wrap everything up. As such it should be fairly short blog today. There were two big issues that folks brought up about the system. The first was that leaving the reduction of Awareness Levels mostly to time elapsing didn’t give the players a lot of agency. While there are the “narrative actions” that players can also take to reduce the Awareness Level, these are unknown variables that are completely contextual and so could not be planned for ahead of time. So we had a think about it and decided to use our current meta-currency (the Sigils) to help with this issue. So now along with time and narrative actions, you can also spend a Sigil to reduce the Awareness Level by 1 step. This solves the player agency problem, and it will also mean that players use (and therefore run out of) Sigils more often which allows for more GM-intrusions in the game, making everything a tad more exciting. 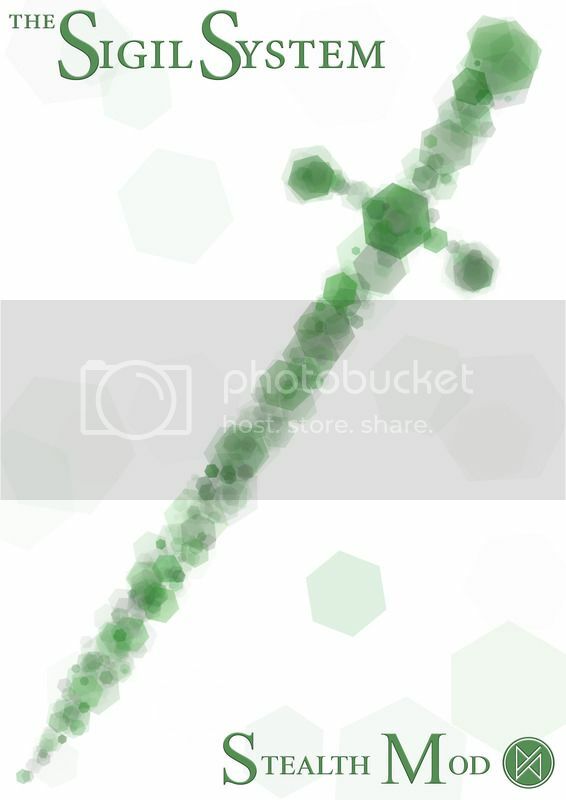 The other issue brought to our attention was one of granularity. For some readers, having ten steps on the Awareness Scale was a bit too much and they would have preferred a simpler and more vague approach. The Sigil System is all about granularity and working with things in groups of 10s so we couldn’t quite change the Stealth Mod to accommodate this, but there is a compromise to be had: the GLYPH system. GLYPH is already a scaled down and simplified version of the Sigil System and so we decided that we can just port over the Stealth Mod to GLYPH as well when we release it. GLYPH is a faster paced game so a 5 step Awareness Scale would go well with it. And, of course, we do enjoy having our cake and eating it too. So, to sum up the Stealth Mod: It all revolves around the Awareness Scale which is a reflection of the mood of the compound you are in. The higher the Awareness Level on the Scale, the worse it is for you and the NPCs in the compound will react to it and you. Failed Stealth Skill Checks and narrative actions make the Awareness Level go up; and time, narrative actions and spent Sigils (or Glyphs for GLYPH) make the Awareness Level go down. If the compound you are in is too big to handle, you can chop it up into manageable zones and any zone the players are not in will simply play catch up to the Awareness Level to the zone they are in. All we need to do now is rewrite all of these journals into something coherent, tidy and tart it all up and then we’ll have it up on DriveThruRPG for you absolutely free. Until then, why not have a look at the campaign book we just released this week which takes place in The Runed Age, where the Sigil System comes from. Just click on the picture and enjoy! Hello everyone and welcome to our sixth dev journal about the Stealth Mod we are making for the Sigil System. In our previous five journal we have covered all the important mechanics in the Stealth Mod and so this journal will give an example of play using these rules. It’s the roaring twenties and, on the upper east coast of the USA, the Italian mafia has its claws sunk into anything and everything they can get their hands on, including booze. Two young and brave entrepreneurial lads (Jack and Bucky) have decided to break into one of the mafia’s warehouse and steal some crates to sell and make themselves a tidy profit. The warehouse is guarded, however, and these mafia thugs aren’t liable to play nice with anyone they find snooping around. It’s the dead of night and Jack and Bucky, dressed all in black (or as close as makes no difference) and with scarves around their faces, have decided tonight is the night they get rich. They’ve circled around the warehouse and have seen that there are only two entrances: the larger doors at the front where trucks pull up to load and unload and a small side door near the rear of the building, both of which have mafia goons hanging around. There are windows, but they are small and almost touching the roof, so it will be a long climb to get up there, and anyone can walk by and look up. Jack decides that a distraction is their best bet. More dangerous, but if they keep quiet it should all work out well. So while Bucky waits around the corner from the warehouse’s side door, Jack skulks towards a car a street over, uses a knife to jimmy open the gas tank’s cover, rips a bit of his shirt off, stuffs it in there, and then he uses his lighter to make sure it catches fire. The GM all lets this happen since it’s far enough away from the warehouse to not have been perceptible by the mafia thugs, and it’s too late at night for anyone to be wandering about this neighbourhood. He does however make Jack roll athletics to see if he can get back to Bucky before the flame reaches the gas in the car, which Jack succeeds on. Jack just reaches Bucky before the car explodes and lights up the night. Exclamations are heard from the thugs and the thieves hear one of them tell the others to go find out what’s going on. Three thugs, including the two at the side door leaves to investigate. The GM tells the players that the Awareness Level is now at Level 3. The door is open and the players slip into the darkened warehouse, succeeding on an easy Stealth Skill Check to see if they are noticed. The only light inside is coming through the windows and so the warehouse is streaked with shadows. The players hear more thugs inside and a successful Perception Skill Check tells them that they just broke up a poker game on the far side of the warehouse with their explosion. The thugs are now on foot and restless. Around the players are just cases of beer, cheap stuff that won’t make them much of a profit. They need to go hunt for the strong liquors in here. They decide to split up and both roll Investigation Skill Checks. Neither succeeds, it seems their eyes haven’t adjusted to the dark quite yet, but there is more warehouse still left to search. However, they aren’t the only ones here, so the GM has them do a Stealth Skill Check to make sure they haven’t been spotted. Unfortunately for Bucky, he failed by 16 and so he was seen for just a second by one of the goons walking around. After a “hey, who’s there” and “who the hell are you talking to, Jim” and a “I just saw someone over there”, the goons are now properly on edge. This is not the night they were expecting. The GM says the the Awareness Level is now at Level 4. The players know what this means: Paranoia. They know that it will take a good 20 odd minutes to subside. For their characters, they feel the tension in the air and can hear this paranoia in their voices and know it’s suddenly not safe anymore. They decide to hide, but 20 minutes is a long time and a lot can happen, so Jack spends a Sigil to lower the Awareness by 1 Level. Level 3 is easier to deal with and only 10 minutes long. Jack and Bucky hear a goon say “you’re seeing ghosts again, Jim” and “I’m not, I swear I saw someone” and finally “well then go look yourself, we’ll right here, you meathead”. A Perception Skill Check reveals to them that the rest of the goons have gone back to their poker game, but Jim is determined to see what’s what. Jack and Bucky regroup and try to find their liquor once again. Both were successful on their Stealth Skill Checks from Jim, and on their Investigation Skill Checks. They found a heavy case of liquor, but now they have to get it out. The GM tells them the Awareness Level has dropped to Level 2 and Jim has decided to set up post where he heard Bucky last. The players are feeling confident so they each spend another Sigil to drop the Awareness Level to 0. Jim goes back to his poker game shamefaced and everything outside becomes quiet. The players decide to take their time with the heavy case and move as slowly as possible with it back to the side door. An easy Skill Check later and they are back at the side door with the poker players none the wiser. The only problem now is that they are hearing voices on the other side of the door. The players had forgotten that with the Awareness dropping back to Level 0, they guards would naturally return to their posts after having sorted out their concerns. They are now stuck in the warehouse. But this is America and Bucky has always enjoyed the vague wording of the second amendment. He pulls out a revolver and the players decide that they’ll simply shoot the guards and make a run for it. Either that or wait here. Jack rolls a Stealth Skill Check to open the door slowly and quietly for Bucky (ready and aiming), but fails miserably and the squeaking reverberates through warehouse, raising the Awareness to Level 3 again. The door opens and Bucky at the goons locks eyes before Bucky fires, hitting him the in the gut and the other goon in the arm as he tries to dodge. It takes all six rounds in quick succession before the two goons are no more, but by then Jack and Bucky can already here every other thug in and around the warehouse running towards them, shouting and presumably drawing their own weapons. They make a run for it, but with the heavy case between them, the penalties on their Athletic Skill Checks are too severe and they don’t even make it a 100 yards before they hear gun shots behind them and see the ricochets off the cars, building and streets ahead of them. There are far more goons than they can handle, especially now that Bucky is out of ammo. They come to the unfortunate conclusion that this isn’t a fight they can win, so they drop the case of liquor and run away as fast as they can. They walk away empty handed tonight, but at least they are alive. But the mafia will now be looking for two thieves around here, and who knows, perhaps they’ll run into the goons again one day. And that’s all folks! The entire Stealth Mod done. Next time we’ll just do a wrap up, talk about the things that did indeed change over the course of these journals (like using Sigils to lower Awareness) and answer any questions you throw at us between now and then. Hello everyone and welcome to our fourth dev journal about the Stealth Mod we are making for the Sigil System. Last time we talked all about how your characters can increase the Levels on the Awareness Scale, both through the use of Stealth Skill Checks as well as through narrative actions. This time we’ll be talking about quite the opposite. This dev journal is all about decreasing your Awareness Level and keeping yourself hidden. The most important factor when it comes to lowering your characters’ Awareness Level is time, pure and simple. When you have aroused the suspicion, paranoia or rage within someone then the best thing to do is just to wait until it passes. Other than the narrative actions outlined below, this will be the main way of keeping yourself hidden in the Stealth Mod. Each Level of Awareness comes with its own time limit that needs to pass before the Awareness Scale will lower a Level. Bear in mind that the time is cumulative, meaning that the time shown above for each level pertains only to that level. 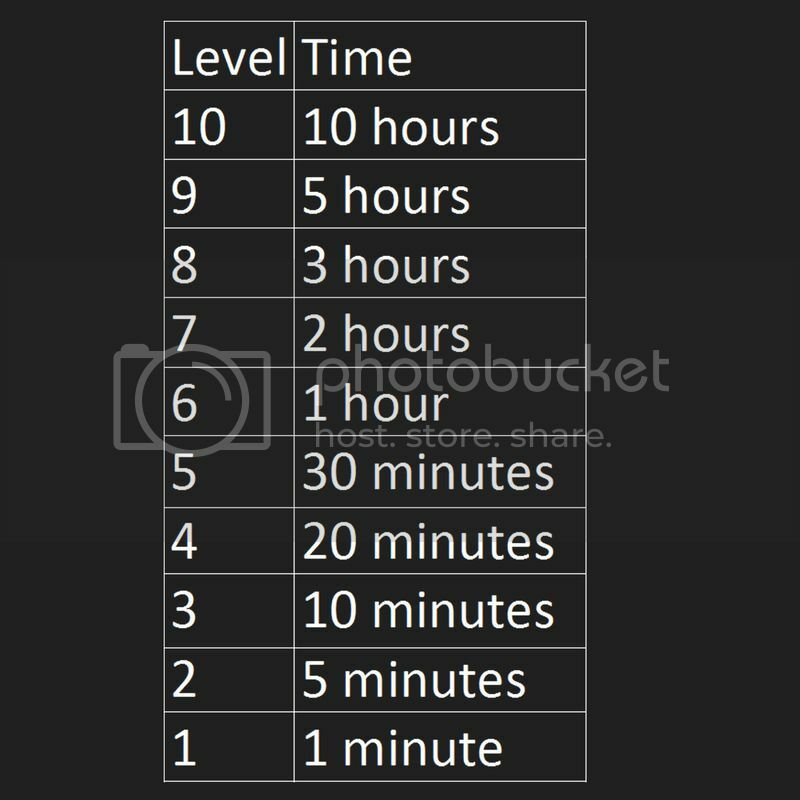 This means that if your Awareness Level is at Level 6, you will need to wait 1 hour for it to drop to Level 5, then wait 30 minutes for it to drop to Level 4, and so on and so forth. 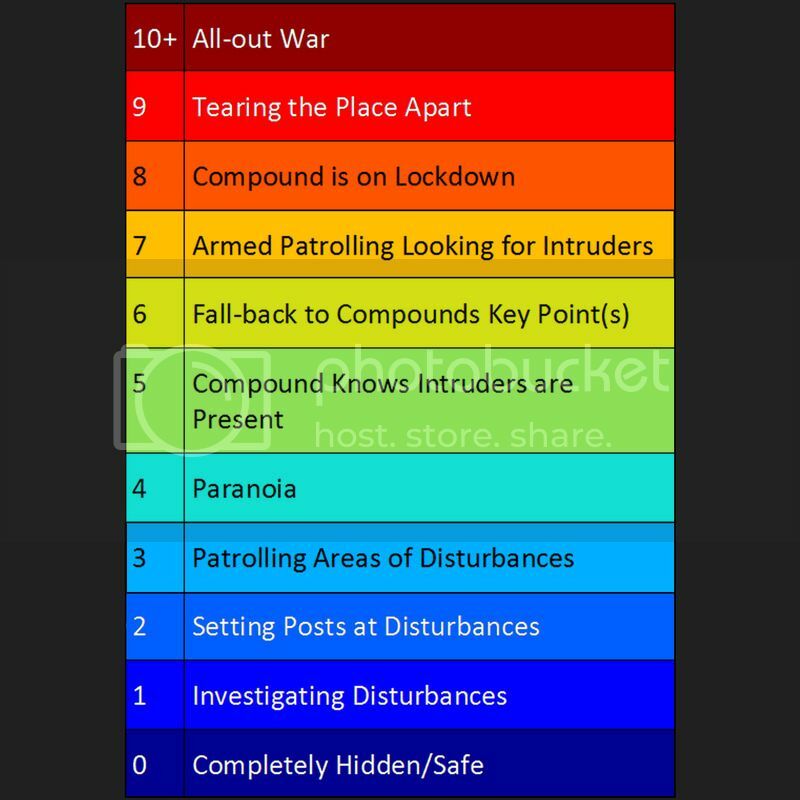 This may seem like an excessive amount of time, but remember that by Level 5 the compound knows you are there and by Level 6 they are actively hunting for you. They won’t just stop after five minutes and forget all about you and think the arrow through their head was just the wind. They will look and hunt and search and only after they have made sure you aren’t around will they relax. To make things even more difficult for you, certain narrative actions that increase the Awareness Levels will come with a time threshold that will need to pass before that Level’s timer starts ticking down. What actions cause these thresholds will mostly be up to your GM but they will involve a response from the enemy NPCs that will need to be handled before things can continue. For instance, should an enemy disappear and the compounds radios him to check on things, they will become suspicious that he isn’t answering. Other than the 2 level bump in Awareness, this action will come with a 30 minute threshold that will simulate the enemies looking for this vanished guard and seeing what happened. The longer the response will be from the compound, the longer the time threshold will be. While you can always wait for the time to tick by until the compound has forgotten all about you, you can be proactive and help them along. This is the most vague of sections as there is no way to predict, or write rules for, all the inventive and creative actions that players will come up to decrease the awareness. However, in saying that, what we can put to paper is that you can use the narrative actions to reverse the narrative actions that led to an increase in Awareness. By fixing what went wrong, you can immediately lower the Awareness Level to what it was before. This won’t work for everything, but you will be surprised what you can get away with. To use the example for above: a guard went missing and the compound knows about this. This would cause the Awareness Scale to increase by 2 Levels and if you are Level 3 already this isn’t good news. So you think quickly, strip the guard down, put on his clothes and try your best to impersonate him. When the higher ups come calling, you are successful in your Deception Skill Checks and they believe your excuse that your radio’s batteries died. Immediately the Awareness Level went back to Level 3 from 5 without waiting for the Threshold or for time to pass. And there you have it, everything you need to keep yourself hidden and continue skulking around where you shouldn’t be. Next week in our Developer Journal we will talk about Zones and how you can chop up large compounds to make things more manageable for your players. Hello everyone and welcome to our very first developer journal ever, for anything really. Before we set up the website and our social media, we had already completed 99% of the work on The Runed Age, and the Sigil System was a quick transcriptional job. The Stealth Mod is exactly what it says on the box: a mod for the Sigil System that enhances and extends the mechanics for more stealth-based gameplay. While there is the Stealth Skill in the Sigil System, it is just one of 20 skills (barring the potential 100 specialisations) and so it doesn’t quite stand out from the crowd. That is what we aim to change. Of course, as with any mod for any sort of game, these rules will be entirely optional, so don’t feel constrained by them, rather add them to your games if and when you want that extra stealthy flavour. So let’s get started with it! The Stealth Mod is meant more as a narrative and Skill challenge than a simply Skill Check. Much like the Social Combat rules already Present in the Sigil System, the Stealth Mod rules are meant for lengthy scenes where being stealthy is paramount throughout it. It is more than a simple Check as narrative actions itself will affect the grander situation. To give an example: to simple sneak past a couple of sentries into a secured building requires only a Stealth Skill Check and falls under the Individual Stealth heading, because once that specific Skill Check is over (success or failure) that “Stealth Scene” is over and done with. Compound Stealth is once you have gotten into that secured building and you have to be continuously stealthy throughout your time there in everything you do or you will either set off the alarm, alert the patrolling guards, get caught on surveillance or all three. Almost all your actions inside that secured building (whether they come with a Stealth Skill Check, other type of Skill Check, or no Check at all) will have an effect on how well you are hidden and you (if at all) you are perceived by your antagonists. That is Compound Stealth and that is what the Stealth Mod is all about. Mentioned in the Sigil System is the use of Skill Check results as positive or negative modifiers for further Skill Checks. In this mod we will emphasise all the modifiers that you can wring out of your Stealth Skill and its specialisations and vice versa. In any stealth based game, outright combat is always considered as a last resort as the noise of a simple fight could wake a neighbourhood and then there goes your plans. Instead, silently taking down opponents with the element of surprise is what you want, and this is where the Skill Check As Modifier comes in handy. As you approach you opponent unseen, you would roll a Stealth Skill Check to determine whether or not he perceives your approach. The success or failure of this Skill Check would then be applied as a modifier to your next Fight Skill Check to take that opponent down. Let’s say you rolled 20 points below your Skill Level for the Stealth Skill Check, this would mean you gain a Modifier of +20 to your Fight Skill Check (on top of all other Modifiers your GM would put on that Skill Check). This means that the better your Stealth Skill Check, the more confident you can be your other actions. The reverse can also be down. Let’s say you are a nimble chap in good health but you’ve never really been all that good at sneaking around; climbing walls though, that you can do with ease. So when you roll your Athletics Skill Check to climb the wall of the secured building, the result of that Skill Check would then applied as a modifier to your Stealth Skill Check to see if anyone saw or heard your climb. The better you are at climbing, the less effort and noise it will take to climb a wall and thus the more stealthy it would be. In the Stealth Mod, all (or close to all as makes no difference) the actions you will take will have an effect on yourself, your surroundings and/or your opponents that in turn will effect how stealthy you are. Next week in our Developer Journal we will have a look at the Awareness Scale that is the central mechanic behind the Stealth Mod and determines just how stealthy you are.